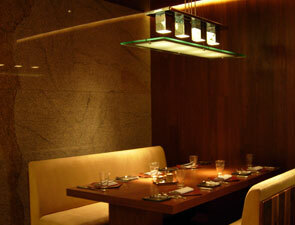 Sensi offers a fun, casual, multinational dining experience. Even though it's casual, however, you might find a few things helpful in creating a dining experience that's as enjoyable as possible. If so, please read on. Seating is comfortable, and tables are well spaced. Upholstered armless chairs are very comfortable, though booths are available if you'd rather sit somewhere a little more private. There's plenty of light, and plenty of room, at Sensi. So although you're surrounded by stone, you won't feel like you're in a stone cave. Light music plays during both lunch and dinner. There are several dining options to choose from, including the main dining room, a second room in the back, booth seating and one of two chef's tables on either side of the show kitchen. No matter where you sit, though, the diverse menu at Sensi is sure to please. And if you simply can't decide, try the Sensi 41; there's generally a variety of ethnic cuisines in this option, which changes quite frequently. Restrooms are large, single-occupancy restrooms. Completely black with some flowers, they're located to the left, off the entrance, on the same level as the dining rooms and completely accessible. The dress code is business casual, although shorts are not allowed at dinner. Complimentary valet parking is available at the hotel, where cabs are also plentiful. AAA Four Diamond Award, 2007; Marble Institute of America Pinnacle Award, Commercial Interior Award of Merit to Intertile Distributors Inc. - for supplying Sensi's Aji stone - 2005.